devices are the first things we greet in the morning and the last thing we use at night. While there is no doubt that they have made some part of our lives easier and more convenient, they are also contributing to health issues, and one of those is digital eye strain. 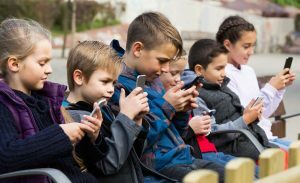 It was only a generation ago that only a small part of the population spent a lot of time reading or on a computer-like device. What was once the realm of the “geek” or bookworm, is now the norm for a much larger part of the population. Increased use of technology and digital devices means an increase in the amount of time spent relatively still while looking at near distances for long periods of time. This is not something our eyes were designed to so constantly and results in visual fatigue and eyestrain symptoms. What are the symptoms of digital eyestrain? Who is at risk of digital eyestrain? While it isn’t possible to avoid the use of technology altogether, there are steps you can take to prevent and minimise the symptoms of digital eyestrain. 1. Talk to your optometrist – The next time you are in for a visit, discuss your technology use habits with us, and we can help protect against future discomfort. 2. Keep blinking – Research shows that you blink less when staring at a screen resulting in dry, irritated eyes. When looking at a screen remember to blink regularly. 3. Adjust the brightness – The brightness of your television, computer screen or device should be the same brightness as your surroundings to minimise eye strain. 5. Size does matter -. Bigger screens are better too. Try to reserve screen time to bigger screens. Avoid watching movies on phones. Instead cast them to the TV. 6. Exercise your eyes – Remember the 20-20-20 rule where every 20 minutes, you look at a distant object 20 feet (6 metres) away for 20 seconds. It is even better to take a full physical break every 40-60 minutes. 7. Keep it clean – Clean screens frequently to avoid dust and grime build up that can cause added eyestrain when looking at pictures and text. 8. Minimise the glare – Glare off walls, glass desktops and computer screens can cause additional eye strain. 9. Not so close – Keep your devices at arm’s length, you want to maintain a distance of at least 40cms. Bigger screens again help here. 10. Set up your workstation correctly – Ensure you have a comfortable chair, the proper desk height and that the centre of your computer screen is 10-15 degrees below your eyes. You live in the digital age, shouldn’t your eyes? Call us today on 07 5520 5900 to discuss the latest technology to relieve the symptoms of digital eyestrain.